'Tis all the guile that my poor fields will know. The reckoning from me of the vanished hours. My little house is covered by a roof that fears no harm, and the grape swollen with wine hangs from the fruitful elm. The boughs yield cherries, the orchards ruddy apples, and the trees sacred to Pallas break under the wealth of their branches. And now where the smooth soil drinks from the runnels of the spring, Corycian kale springs up for me and creeping mallows, and the poppy with promise of untroubled sleep. Moreover, if my pleasure is to lay snares for birds, or if I choose rather to entrap the timid deer, or draw out the quivering fish on slender line, so much deceit is all that is known to my humble fields. Go, then, and barter the hours of flying life for rich banquets. My prayer is that since at the last the same end waits for me, it may find me here, here call me to account for the time that I have spent. 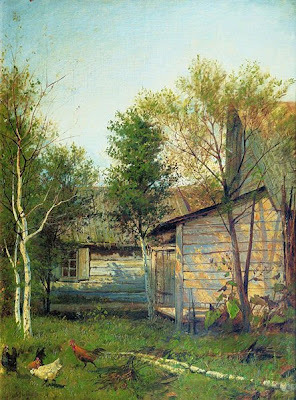 My cottage is sheltered by a roof that fears no ill; the grape, bursting with wine, hangs from the fertile elm; cherries hang by the bough and my orchard yields its rosy apples, and the tree that Pallas loves breaks beneath the rich burden of its branches. And now, where the garden bed's light soil drinks in the runnels of water, rises for me Corycian kale and low-growing mallow, and the poppy that grants easy slumber. Moreover, whether 'tis my pleasure to set snares for birds or hem in the timid deer, or on fine-meshed net to draw up the affrighted fish, this is all the guile known to my humble lands. Go to, now, and waste the flying hours of life on sumptuous feasts! I pray, that my destined end may find me here, and here demand an account of the days I have lived. uvaque plena mero fecunda pendet ab ulmo. Palladiumque nemus pingui se vertice frangit. et non sollicitos missura papavera somnos. hos tantum novere dolos mea sordida rura. hic precor inveniat consumptaque tempora poscat.